One.The National Ballet of Canada announced Monday that Alexei Ratmansky, the former artistic director of Russia’s Bolshoi Ballet, will choreograph its 2011-12 season production of Romeo and Juliet. Three.Shirley Temple was a child star whom everyone adored. In adult life, she made a comeback of a different nature, she was U.S. Ambassador to the African country of Ghana. Four. Don’t trim cat’s whiskers! They grow on their cheeks, eyebrows, chin and on the back of their front legs. Facial whiskers are specialized “Tactile’ hais with roots that are three times longer and deeper than normal hairs. These whiskers are surrounded by blood vessels and nerves so that they are extremely sensitive. 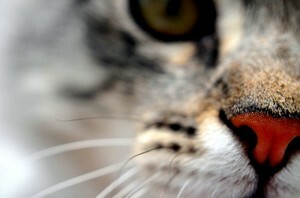 A cat’s whiskers are roughly as wide as her body and the tips are sensitive to pressure. Your cat will measure the width of an opening by moving her head in and out. Five. Birds of a feather flock together, and it’s hawks, they travel in casts. Other bird groupings are called a bevy of quail, a host of sparrows, a herd of swans, a siege of herons and a muster of peacocks.